We have the use of a new and innovative sonic drilling technology. 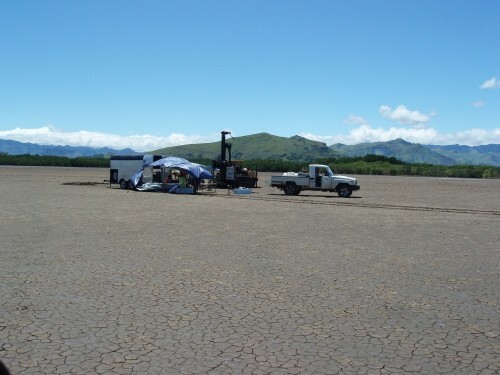 This technology is capable of both very rapid drilling and the recovery of reliable, virtually intact samples from the alluvial profile for analysis. Sonic drilling has only been available for commercial use in recent years. Among its advantages over conventional drilling methods such as diamond drilling, reverse circulation and standard percussion and Banka drilling is that the sonic drill recovers the sedimentary units in tubular samples as if “in situ”. No dill fluids are injected into the hole during drilling that could either wash away important parts of the sample or contaminate the sample. Because the sonic method recovers samples of the sedimentary units intact more accurate logging and analysis of the deposits is achieved. A further advantage of the sonic method is that holes are drilled much more rapidly than is the case with conventional drilling methods.